Welcome to our page of Labor Day jokes. 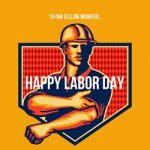 Labor Day , which is celebrated on the first Monday in September, is a creation of the labor movement and is meant to honor the contributions that American workers have made to their country's social and economic success. Labor Day traditionally marks the end of summer and students usually go back to school the following week. I'm going to spend Labor Day putting my liver to work. Did you hear about the Labor Day joke? It doesn't work for me. The best way to celebrate Labor Day is by filing for unemployment. In the week before Labor Day, Eli, a dirt-poor country farmer won the Lottery - half a million dollars. So to celebrate, he treated his wife and their four kids to a trip to see the Labor Day parade in New York. He booked them rooms in the Sheraton International at the corner of Park Circle and Central Park North. They'd never been to anywhere like New York before, in fact they'd never traveled further afield than their local town, so when they got there they were completely bowled over by all the glitz, glamor and excitement of the "Big Apple". Eli and his son Clem were particularly mesmerized by a shiny box with silver walls in the hotel reception. They'd never before come across doors that could move apart, and then automatically close again, as neither had seen an elevator before. So they were totally amazed when a little old lady entered the shiny box and the doors closed on her. The lights on the wall by the doors flashed for a minute or so, then the doors opened and out stepped a beautiful young woman. Eli turned to Clem and said, "Son, go get your mother." Can you still "work it" on Labor Day? I said to my son, "Do you know, most people don't have to work today, because it’s Labor Day?" He replied, "If people aren't working, shouldn’t it be called "No-Labor Day?" I wish I made enough money from my labor to be able to afford a Labor Day vacation. Happy Labor Day! Oh wait... we live on a farm. Never mind! The Labor Day holiday means I get my unemployment check a day late. This Labor Day let's salute American corporations for keeping the Chinese gainfully employed. This Labor Day, take comfort in the knowledge that the pressure to have fun this summer is finally off. If all wealth is gained through labor, why is it that the wealthy never have to do any?